Debbie lives in a rural town in New South Wales, Australia, and she’s sharing her story about how she came to start her blog and what blogging means to her. My blog, Debs World is the world according to me … in photos, words, stories and sometimes even poetry. It’s a fun creative outlet, and as a bonus I get to meet some amazing bloggers from all around the world. It keeps me feeling young 🙂 I’m living life to the fullest and embracing the challenges that come with midlife! I’m now a new grandmother as well and I am as happy as a pig in mud. When I started blogging a few years ago, it was as a creative outlet. 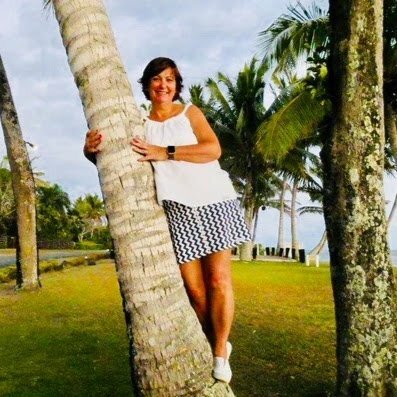 Since then I’ve started blogging about travel, retirement, my Mother of the Bride journey, running, cycling, family, and most recently about becoming a grandmother for the first time….you name it just about everything! My blog is really just pieces of my everyday life, so Deb’s World is a very relevant name. I don’t take myself too seriously and am very surprised that I have amassed the following that I have! I love an adventure and sharing my travels and stories. My Deb’s World blog originated a few years back when I was feeling stifled by my professional work environment and needed a creative outlet. At the time I worked in a correctional centre for male inmates, as the Manager of Educational services and programs. I had been in that environment for over 20 years and the constraints on what I could talk about, what I could show of my personality, and how I could express myself – was wearing. I had to be on my guard the whole time, and watch out for my teachers as well, so that no-one was put at any risk. Overall I enjoyed my role and found it to be very rewarding but at times it was stifling. My blog started with travel stories, personal reflections and as the years went on I extended myself by participating in writing and photo challenges. I am now engaged in various blogging communities and this has been one of the really unexpected bonuses of blogging. I love all things orange and yellow. I love a good cup of tea – black, very weak and a dash of honey! I live in a small rural town in NSW (Australia) and enjoy our easy lifestyle. I have a compulsion to step on crunchy leaves and bark just to hear the satisfying crackle/crunch. I completely lose myself when reading a good book. I like helping others and doing good in the world – being a Rotarian helps satisfy this urge. I have a Bravery Award from the Queen. Here’s a post that tells the story. I hate spelling mistakes but sometimes do make them (horror!). I was called a Humming Bird on speed by a work colleague and it’s now stuck to me. I was told that inmates (and some staff) within the the correctional centre found me to be very intimidating – you have no idea how much this amused my daughters! I’m not really scary, I promise! A big thank you to Debbie for contributing today. Do pop over to her blog and read more of her stories, which are engaging and insightful. You can find her at Debs World. ← The Long and Winding Road to Blogging.